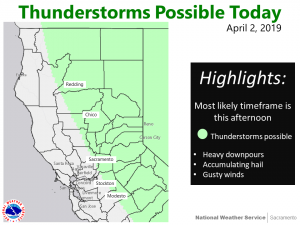 April 2, 2019 – Unsettled weather this week as several weather systems impact NorCal. The late-week system will likely be the strongest with periods of heavy precipitation and lower snow levels. Radar indicates the main area of showers is spreading from the valley into the northern Sierra early this morning as another short-wave pivots onshore. Profiler data indicates the snow level remains above 8k ft and Caltrans cameras still indicate a wet road surface on I-80 over Donner Pass. Current temperatures range from the mid 30s to mid 40s over the mountains to the 50s across the Central Valley. Cyclonic flow and the approach of the next short-wave will continue showers across the region today. 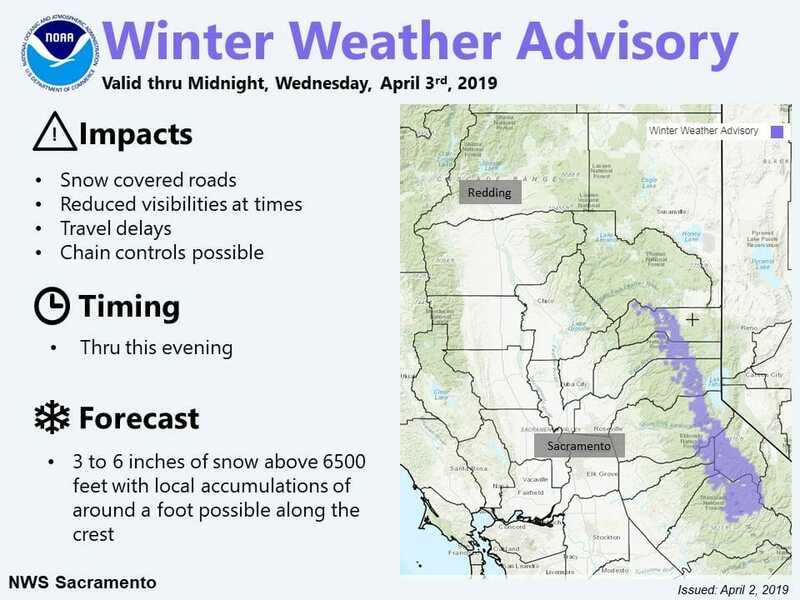 Slight lowering of snow levels may bring accumulating snowfall to the higher passes by late this morning that will continue through this evening. 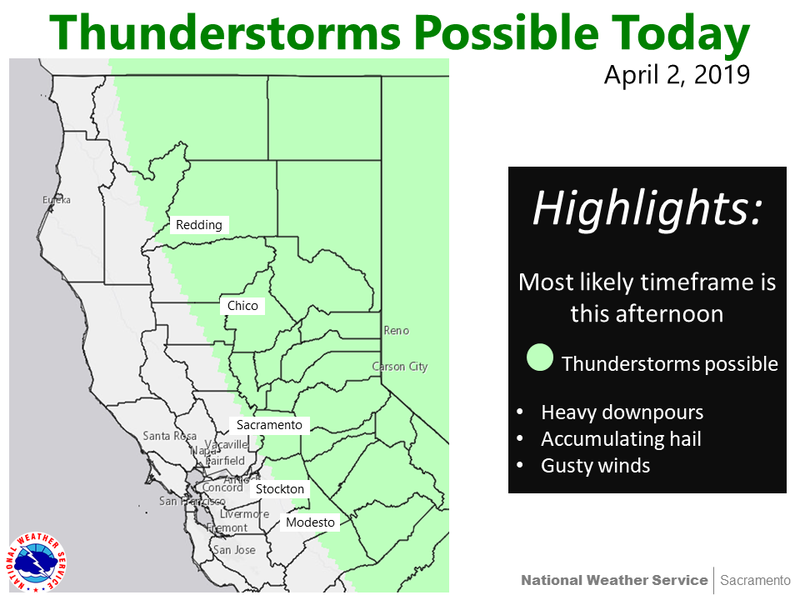 A few thunderstorms will also be possible accompanied by small hail, brief heavy rain and gusty winds. Shower activity should wind down tonight as upstream ridging approaches. While Wednesday should be dry for most, some scattered showers cannot be ruled out over the northern mountains. These should not amount to much given the transient ridge overhead. By Thursday morning, an upper trough similar to the one arriving today will impact the region. Snow levels should be slightly lower with this system, likely in the 6,000 to 6,500 foot range. It is expected to be a quick mover as it exits the state by later that night. The main precipitation event this week is forecast Friday and Friday night as a late-season AR moves through NorCal. Precipitation amounts are forecast to range from 1-2 inches in the valley with 2-4 inches over the foothills and mountains. Areas of light to moderate precipitation expected over the weekend as weakening AR remains focused mainly north of I-80 and embedded vort maxes provide UVM. Snow levels continue around 5500 to 7000 feet Saturday and Sunday. Deterministic models differ significantly Monday with EC continuing unsettled weather while GFS builds upper ridging. On Tuesday, models become similar again showing another short wave trough approaching. While confidence is lower, forecast for now keeps some low chance POPs over the northern third of the CWA early next week.